Gives you an option to switch between Native thumbnails & Timthumb, It gives you full control on selected images to show on homepage. 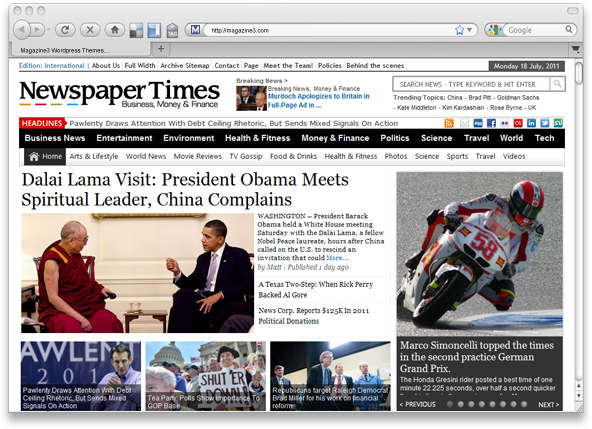 NewspaperTimes is compatible with WordPress 3.0 Navigation feature. Now you can set your own navigation menu by simply dragging items in Menu. Now add your logo, customize navigations, setup featured categories & ads in just 5 mins. Long story short, You can setup awesome professional website in few minitues. NewspaperTimes theme has 3 Advance Page Templates that will allows you to have features like Contact form page, Archive Sitemap Page & Full Width Page.